In my last post I muttered about the shortcomings of close-up shots because you lose the wider setting which may have much more to tell you. But I took this one because it made me smile: the contrast of the green longhorn beetle on liatris spicata; the liatris against the green grass, and the congruent shade and form of beetle and the blades of grass. Not a scheme I would wish to replicate in my own home, I hasten to add. 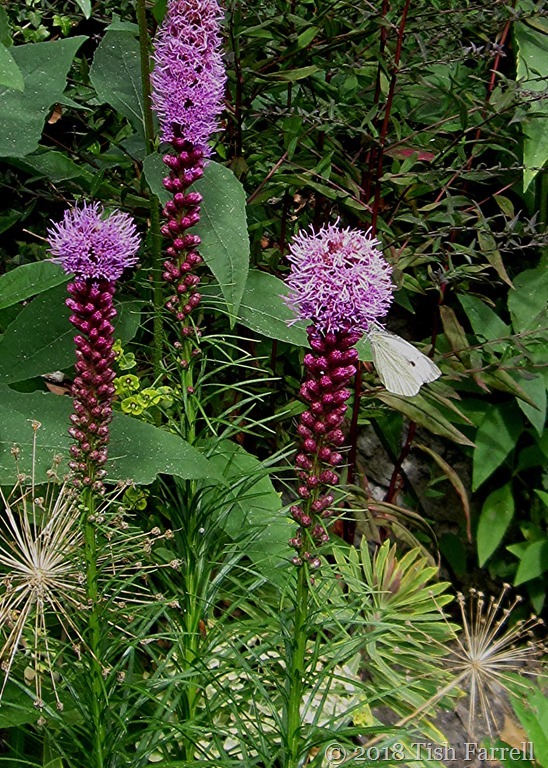 Liatris, with its tall purple spires, is now an English herbaceous border staple, and another magnet for insect life. But its true home is on the North American prairies where it has the names of Prairie Gay Feather and Dense Blazing Star. The first photo was taken at the allotment where my neighbour is growing insect attracting plants, but I have also grown it in my garden for the first time this year – seen in the second photo along with all the rapeseed dust from the previous night’s harvesting. (There are disadvantages to country living, and the combine harvester’s dust and chaff cloud that buried our house and garden was one of them). Now I know where liatris comes from, I have a sudden yen to set it free to colonise the fields of Wenlock Edge. I see it growing up tall as tall nodding its plumed heads over hillsides of wild oats – and no more compacted earth, chemical sprays and harvesting dust. Still, I know too that this is exactly the sort of impulse that has led to major biological disasters across the world, not least the devastating spread of the very lovely water hyacinth, which also grows in alluring purple spires, choking the waterways of the African continent and beyond, making poor people even poorer; killing livelihoods. It was most probably a colonial gardener in the former Belgian Congo who was responsible that piece of horticultural mayhem; the plant escaped from a beautifully contrived water garden and up the riverine systems of Central Africa and into Lake Victoria, far away from its native South American quarters where there are local natural forces (weevils) to keep it in check. It has infested North America too, where there is big business in selling big water hyacinth harvesting machines. So I will contain my expansionist inclinations, and enjoy the liatris where it is. It is actually a medicinal plant, well known to North America’s first nations, the Cherokee in particular, and used to treat many conditions. 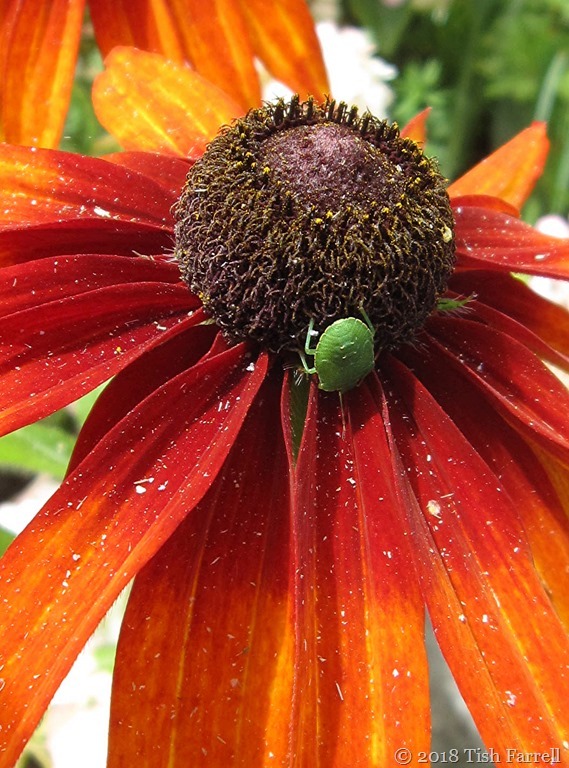 And now for some more striking flower-insect colour-scheming – a green shield bug on my dusty Russian rudbeckia, grown from seed last year – another floral (hopefully benign) displacement. 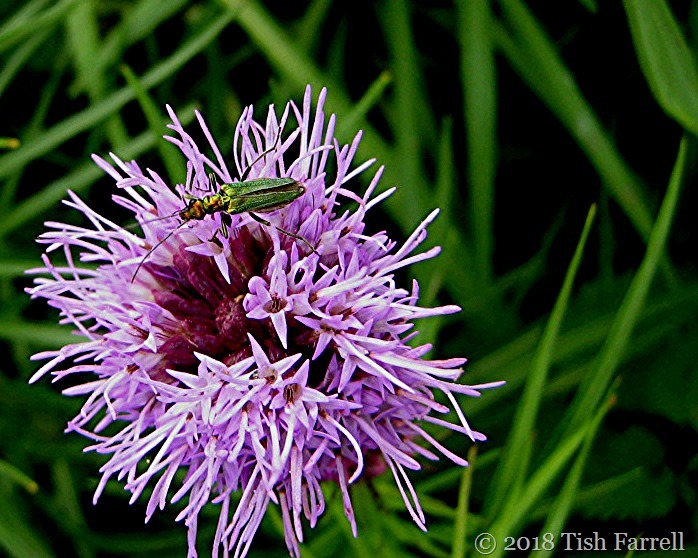 Posted on August 3, 2018 by Tish Farrell	This entry was posted in Environment, gardening and tagged alien weeds, botanizing, green shield bug, liatris, longhorn beetles, Tish Farrell Writer. Bookmark the permalink. Found bits in the bed last night. G wasn’t quick enough to shut all the skylights before the storm blew in. The field is full of chaff too. I’ve been gathering some of it up for the compost bins. Need to make some advantage of it. Probably have human manure spread on the field next, as I think they get it cheap from the sewage works. It has a particularly low grade lingering odour unlike animal dung. There’s already a whiff of it from other fields about the town. Bring back mixed rotational farming, that’s what I say. The soil scientists are saying it too. Oh no 😱 human manure I thought that was banned, I think it is over here and we have issues with fruit and veg imported from China because of their use of human manure. In fact I think produce from China is banned. Good idea to use the chaff for compost, though I imagine it will need well wetting down to make it compost. I think it’s well processed, though that doesn’t make it any better! You are right about the chaff. I’m mixing it with hedge cuttings and comfrey leaves, but it needs a good dousing too. I really like the close ups – particularly the last one. Another set of beautiful photos and I could definitely see all the dust on the flower in the last photo. I imagine all that dust gets EVERYWHERE and would make me crazy. A very thoughtful commentary on invasive plant species. We too are experiencing problems in our park areas with strangling dog vine and aggressive fish species that are now trying to make their way up the waterways from the Great Lakes. It seems mankind has really made a mess of things in so many ways. Impressive, Miss Tish. A fortunate capture. Oh, and the flowers are nice, too! I think you may well be right. Thanks for the ID Ark. I have just remembered that Mr G is an entomologist! Don’t I feel a berk for telling you what you probably already know! No need to feel a berk. G actually only knows about food storage and plant pests, so I think it’s safe to say he would have had no idea about the longhorn beetle. So don’t hold back with the IDs. How interesting that we both, on our own, did a post about invasive species today, Tish. 🙂 Dare I say “Great minds…”? I love your macro shots, Tish, especially if you included a colourful insect to your photo. Wonderful photos. Also much to learn about migrations of plant life. Didn’t realize it was so dangerous. Wonder if there’s anything that we can do about that. We’ve heard about some strange and sometimes scary invasions of wild life. There are different explanations of the African parrots who moved to Jerusalem years back. Some think people brought them, and others think they flew in by themselves. They remain closed mouthed on the subject, but do wonderful imitations of all the most recent automotive imports, ambulances, and even of the our local cats. What a hoot about the parrots! In Britain the Victorian plant hunters brought us some real pests that now cost local authorities huge amounts to control – Japanese knotweed and Himalayan Balsam which colonises waterways being prime examples. The presence of the former on a property can impact on people trying to get mortgages on a house. Both plants are almost impossible to eradicate. It’s hard to undo these kinds of things. 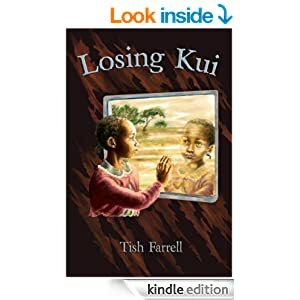 Great post Tish; visually lovely and a good read. NZ proved to be a very good environment for so many species brought by colonists, and we are still paying the environmental price. Your “just because we can” comment is so tragically apt. And the consequences can be so very monumental. As anyone with a bit of land here, who is constantly fighting gorse, will attest. I love to bug spot and you captured two great ones here. How nice of them to be filmed on contrasting plants. The dust sounds like a bit of a nightmare! We get a lot of dust in our house and bits of hair and hay on the Velux from the farm. And we sometimes have to walk around with a peg on our noses, but it is so nice not to live on a suburban street and hear constant traffic noise or drunks heading home from the pubs. Your comment on “just because we can” is so very true. Not to mention the disasters created by introducing a species because they thought it would deal with a problem, only to cause another even greater problem. Cane toads and rabbits spring to mind, as does black wattle trees introduced into South Africa. I think those bugs chose their backgrounds on purpose – to show themselves off! I was also thinking of cane toads and rabbits. And then there’s the Nile Perch in Lake Victoria that decimated the amazing indigenous fish diversity. We are regardless beings! We are indeed. The planet would probably be much better off if we were the ones to be extinct. Shield bugs give me the creeps, but it’s a lovely contrast on the rudbeckia. Not the loveliest of creatures, I agree. I’ve always found it amazing that in nature, no matter what the coloration, nothing is ever “not a match.” It’s all just colors! That’s true. Doesn’t seem to work at all the same with chemically contrived pigments. I hear you about closeups & pan shots – I am still working on how to make the wide shot look as good; I struggle with light and lines on these as I can’t seem to make the photo do what I see in my head. I love the background you provide on the flora & fauna you encounter on a daily basis. Liatris – I am now acquainted with you! So happy you like the intros to my flora and flora, Ju-Lyn. We all learn from each other here on Word Press. Happy Sunday! Indeed we do! and that is one of my great joys of being in this WP community! Have a wonderful weekend! Happy weekend to you too, Ju-Lyn.